Not sure what the Blogger Bods are thinking, missed all kinds of deadlines (sorry Chris!) but I really needed to have my post on line today. Because girls and boys, we have a real anniversary on our hands! 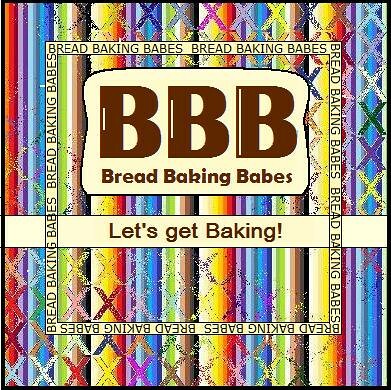 Yes, this month has us celebrate the first year anniversary of the Bread Baking Babes! Can you believe we baked 12 different, wonderful loaves of bread in our first year? Each one of them as different as we Babes are different from each other, but all of the breads -and the Babes- have their own unique handwriting; rule-free, nutty, fibrous, well-shaped, sweet, hearty, bold, long, round, flat, boisterous or filled. I think Tanna and I never could have imagined that our mail-exchange a year ago about starting this group just to bake bread and who we should invite would knead such a wonderful group of bakers together. We had so much fun this past year, shared laughs and stories, bitched and cried together, we were all there to celebrate or support when one of us was up or down. We miss Sher terribly, she was one of us right from the start and her passing away shocked us to the core. In the wake of this Glenna bowed out to re-focus. We miss both of them and they will always be our Babes. We needed some time to recover but with this anniversary coming up decided to add two Babes to complete the group again and invited two long time Buddies: Gretchen of Canelo y Comino and Natashya of Living in the kitchen with puppies. Tanna made a wonderful bread to celebrate our Buddies, showing each and every bread we made this past year in her post ánd linked to each and every Bread Baking Buddy that baked with us. Thank you all for baking, you're the best! When we started this group we decided from the get-go that our group would stay small, our own Baker's dozen of Kitchens getting together monthly to bake, to laugh, share coffee and stronger stuff, so that's why we invented the Buddies. If you would like to be a Buddy too, read this post. Being a Buddy is a care-free role, just let us know you baked our monthly challenge within some 10 days of our posting and you'll have your own Buddy Badge! All badges are carefully designed by wonderful artsy Lien by the way! As it happens February finds Tanna as Kitchen of the Month, she chose a walnut-five grain bread for us to bake. I baked quite early, first time without walnuts and substituting almost all of the requisite grains for different ones and adding walnut oil to the dough. Pantry-panic resulting in a use-what-you-have. I made a 9x5" loaf and some thing french bread. We really loved that first bread, I missed the walnuts but I need to have my private cracker-elfs to perform the task my hands can't. The second one had walnuts in it, I left the house for an entire day and came back to ..... nothing! No pics and very satisfied boys raving about a wonderful bread, lovely crust, great sandwiches... yeah right. This is one recipe I will keep coming back to. Very very versatile, easy to slice, nice crunchy crust and because of the small amounts of different grains easy to use/substitute. Very nice choice and healthy too! **The lumberjack flour is a fancy name for a whole wheat mix with rye, linseed, millet, wheatbran, soy, buckwheat, corn. I used an autolyse/volcano method where you mix all of the liquid and 2/3 of the flours plus all other ingredients into a shaggy dough, covered it with the remainder of the flours and leave it be for about 20-30 minutes. The yeast will start working and eventually push cracks in the surface flours. Then you start mixing, either by hand or mixer. A wetter dough but I didn't add flour, used the Bertinet "slapping" method to get more air into the dough. First rise was quick (which I didn't expect). Surprisingly enough with all the less-gluten flours this dough behaved very well in rising and proofing. First bulkrise about 50 minutes, shaped another hour or so. Bake at 400F for 40-50 minutes. I expected a dense bread but as you can see in the pics it had a lovely crumb, tight but not dense or overly moist. 300 grams of walnuts is a lot, experiment and see what you like! It really has exceeded our dreams sort of like a loaf of bread. I really don't have words to get about what fun and learning we've had. Karen, I was so excited that you and Tanna invited me to join the Babes. And I've so much fun over the past year, I can barely hold in a "squee" of delight. Beautiful loaf! Such a perfect colour. I love the varieties of flours you have access to - such fun! Lovely post, and thank you for the warm welcome - I look forward to lots of baking, drinking and laughing with you. Beautiful! Definitely one I'll have to join in on. I'm so glad I found you on twitter. I'm looking forward to visiting your blog more often. Karen as Tanna says, you really need to train them better - they should understand by now that they MUST photograph everything the eat BEFORE thye eat it! Your use of chickpea flour is making great echoes here in my kitchen I on a total chickpea flour trip here! Thanks for the BBBs! Great you sneaked in! Love your loaf. Gram flour really makes a wonderful soft bread doesn't it. I found I had that lumberjackflour in stock after all... never translated it of course so I didn't think I knew what you were talking about. Thanks for starting this group Babe and letting me in through the front door ;-). This has been such a fun year, I've enjoyed all of it! Your bread looks wonderful, nice slashing! Love to visit the BBB blogs to see what y'all baked. 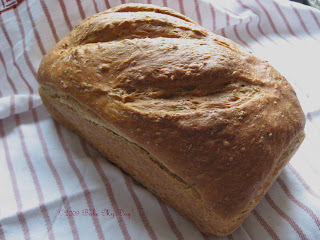 This bread looks so great...nice that you used walnut oil. Looks like a great 'play around with' recipe, too. Hi! I joined the Bread Baking Buddies this month with this wonderful bread. Yours really turned out beautifully and the sandwich looks so yummy! Hope to join you all again next month.